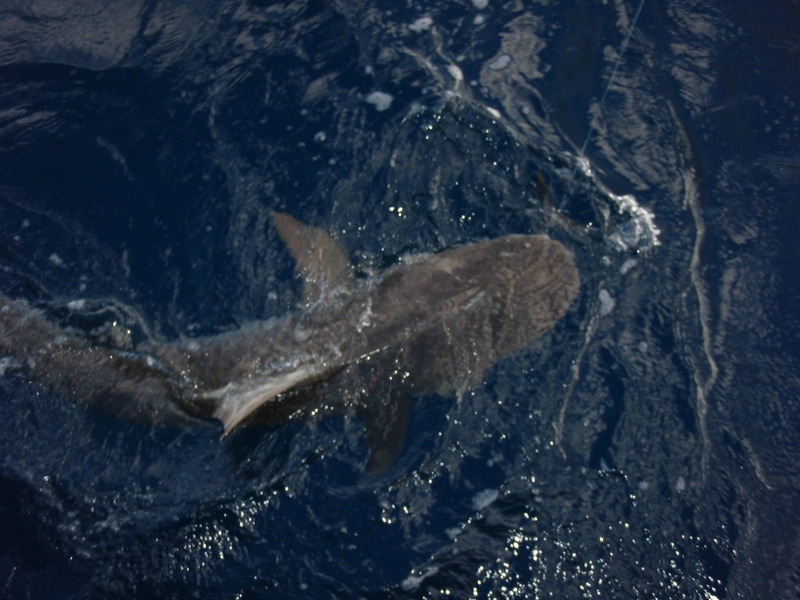 A rare look at a juvenile Tiger Shark as it swam around the boat during one of the Lady K’s morning trips. The shark stayed around the boat for 15 minutes so the crew decided to give the beautiful creature a handout a put a bonito to good use. 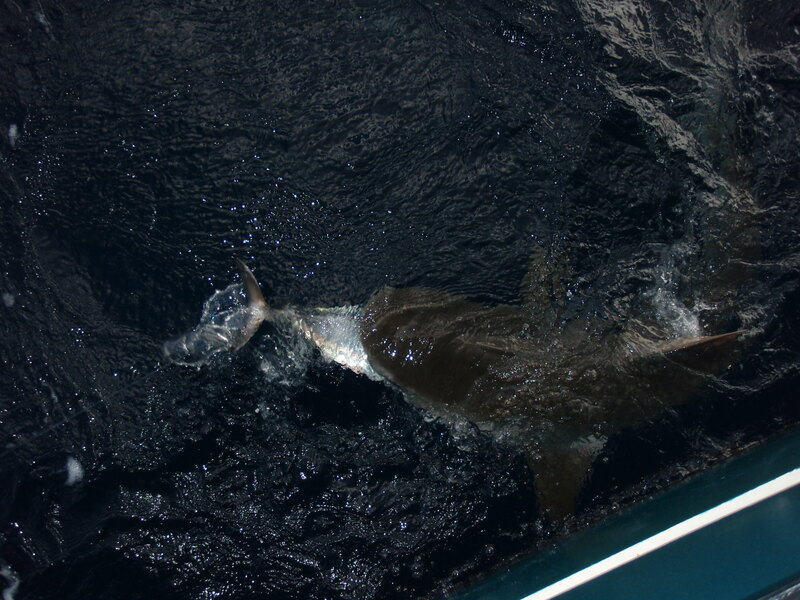 This Tiger Shark measured between five to six feet and may have weighed between 75 to 90 pounds. 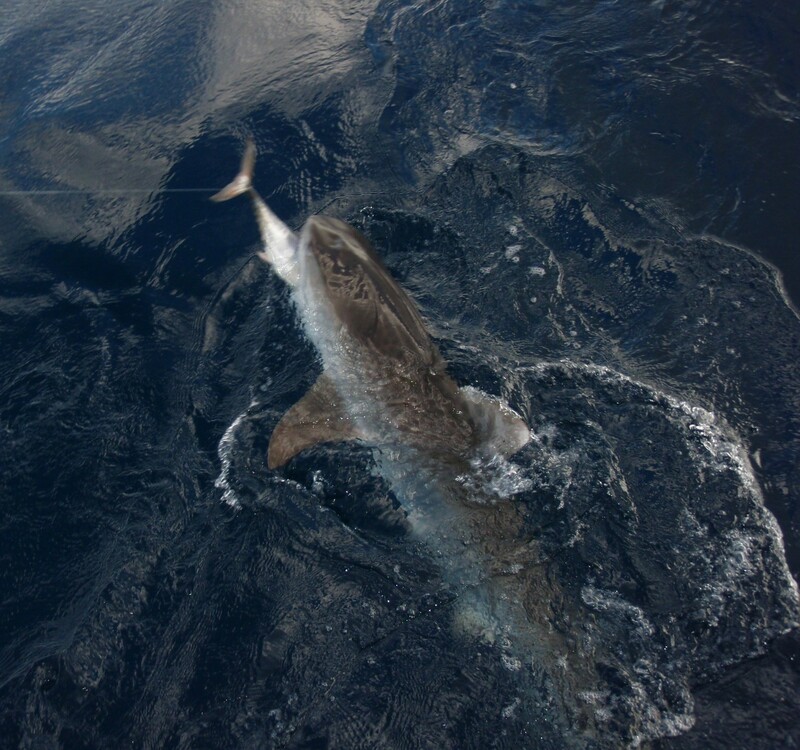 Tiger sharks can grow to lengths of between 12 to 20 feet long with weights of 850 to over 1,400 pounds. They are the garbage cans of the sea, eating everything from sea turtles, sea snakes, sea birds and smaller sharks to metal cans and license plates. Tiger Sharks are responsible for a large percentage of fatal attacks on humans, although rare, and are regarded as one of the most dangerous sharks. Tiger Sharks are also one of most colorful sharks with their brownish-gray backs and white sides which are patterned with black dots and stripes just like a tiger. This feature also makes them a favorite for replica fish mounts since the species is threatened do to “finning”, where commercial fishermen cut off the fins to sell to the Asian markets for shark fin soup. Along with rare sights such as these, anglers have been catching a few King Mackerel up to 20 pounds and the afternoon trips have seen several Sailfish releases this past week. A few Mahi Mahi have been showing up along the rail also during the afternoon trips with fish to 15 pounds. Bottom action is producing some Vermillion Snapper, Porgies, Gray Triggerfish and Jacks. So come on out, relax and enjoy a day on the water aboard the Lady K.
« Thank You to Our Crews!